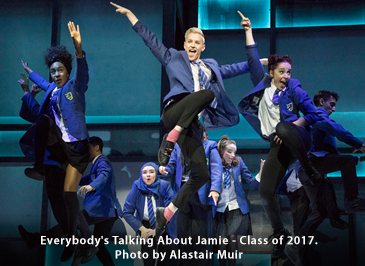 Welcome to the Everybody’s Talking About Jamie website which is owned by NIMAX THEATRES LIMITED of 11 Maiden Lane, London, WC2E 7NA, UK (Company Registration Number 05493237) (“we”, “us”) and operated by Premier PR Ltd of 2 – 4 Bucknall Street, London, WC2H 8LA (Company Registration Number: 01707417). This Privacy Notice sets out how we collect, process, use and protects any information that you give to us when you use this website or use a service that we offer. We are committed to ensuring that your privacy is protected. This Privacy Notice forms part of our basic policies that we handle any information you supply to us in accordance with this statement and with the law and only for the purposes for which you have explicitly consented, for example to subscribe to a newsletter and/or further marketing information regarding special offers and promotions which may be of interest to you. Should we ask you to provide certain information by which you can be identified when using this website, then you can be assured that it will only be used in accordance with this Privacy Notice. We may change this policy from time to time by updating this page. You should check this page from time to time to ensure that you are happy with any changes. This Privacy Notice is effective from 24 May 2018. Your newsletter subscription information may be shared outside of the European Union to enable the fulfilment of this service. You can unsubscribe from any marketing information at any time by clicking the unsubscribe button at the bottom of all newsletters or by emailing us at data@nimaxtheatres.com*. We use advertising tracking cookies to review browsing history, including visits to this website, to identify people to whom we wish to show advertisements on websites operated by third parties, to track our own advertising and to record how many visitors are referred to our site from other sites. We believe that showing relevant advertisements is in your interest as well as ours, but we respect your decision whether or not to participate in personalised advertising. • if you have previously agreed to us using your personal information for direct marketing purposes, you may change your mind at any time by emailing us at data@nimaxtheatres.com* or by clicking the unsubscribe button at the bottom of all newsletters. You may request details of personal information which we hold about you under data protection legislation. If you would like to know what data is held about you, or if you would like to amend or delete any information held about you, please send an email to data@nimaxtheatres.com*. *Please note that we are unable to respond to specific requests about performers or the productions via this email address.